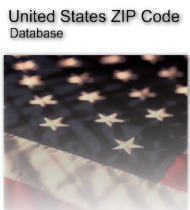 The Gold Edition contains a complete listing of all United States ZIP Codes, associated geographic coordinates, population based Metropolitan Statistical Area codes, times zones, DST recognized, FIPS codes and county cross-reference data. This data is well suited for many type applications. Typical uses include ZIP Code lookup, ecommerce, user input validation, customer support and marketing, nearest dealer location and so on.